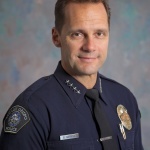 San Luis Obispo Police Chief Steve Gesell will be placed on paid administrative leave by the end of the work day, today, Friday, May 8, sources say. It is the first step in what reliable and informed sources say is City Manager Katie Lichtig’s plan to remove Gesell from the city payroll. Those sources have confirmed rumors that have been swirling for months that Lichtig has irreconcilable differences with the chief. City officials are not disclosing the reason for Gesell’s departure. The city council is expected next week to discuss a payout, likely to be in six figures. In other cases, Gesell’s actions violated written city policies. Nevertheless, Lichtig and Director of Finance Wayne Padilla dismissed concerns about many of the violations. Gesell’s actions were excused as a “consistent application” of policy according to a “historical interpretation.” Historical interpretation means that even though policies and procedures have been laid out, prior practice allows them to be violated without consequence. Some of Gesell’s expenses that have been questioned involved participation in events sponsored by the Commission on Peace Officers Standards and Training (POST). Lichtig and Gesell went on some of the POST-funded trips together. City officials refused to comply with requests for documents under the California Public Records Act showing expenditures for the training. City officials said Tuesday that they disposed of all requests for financial reimbursements from POST and none were available for review. POST officials said the city is required by California law to retain the records for a minimum of three years. Lichtig and Gesell did not respond to requests for comment. Don’t miss links to breaking stories, like CCN on Facebook. you, me or almost anybody else not part of the good ole boy club wouldnt be getting a six figure payout….. I believe the words u are looking for is six man cell. but we don’t have any corruption here in slo, pay him off, look the other way, n everybody go on about there business. There was recently a whole big shake at City Hall with the City Clerk, Personnel, Administration shifting, rotating, reorganizing and hiring more staff or reclassifications and paying more for the same duties. Very interesting changes! Can anyone explain why Lichtig is still employed by the City of SLO? Get out of town?? Doesn’t she only spend 2-3 days a week or is it every other week in SLO and spends the rest of the time at her Beverly Hills home?? Malibu, not BH. She worked for BH. City officials are not disclosing the reason for Gesell’s departure. six figure payout for stealing money? ya thatd be pretty hard to explain I would imagine, being chief of police n all. can only imagine how well everybody else on the force or in the city is supervised. Well, looks like people will be dusting off their resumes. Undersheriff Tim Olivas would be the lead candidate IMHO. Someone said Olivas is a candidate? I can personally tell you that Olivas has the same slackard, spotty, and disinterested beliefs in his duties of law enforcement as his boss, Parkinson. Find somebody else, quick, since Olivas would fit right in with the SLO council’s poor judgment in retaining Lichtig. If you are looking for a QUALITY job and not the same sloppy work, questionable judgment and CYA insider trading leadership that this county suffers from, then Olivas would NOT do a good job at the helm of SLOPD. Do NOT trade one questionable local Peter Principle promoted top cop for just another. Barney Fife would be better than any of them. by by chief clown shoes. AW, City Council don’t give him a pay out!! Start looking at the source to the problem a’ la Lichtig. I think we would be better off without Lichtig. Why not give a huge payout, the voters gave them their slush fund to do with as the city manager see fit. Bonuses and raises for all city employees, pension spikes for all, enjoy.